Josh Homme uses the original Univox Super-Fuzz Pedal in his second pedalboard configuration, an important component that Homme uses in the Queens of the Stone Age. On this page of TheWho.net Pete's use of the Univox Superfuzz is dated from 1968 to 1979 using extensive photographic evidence from live Who shows of that era. 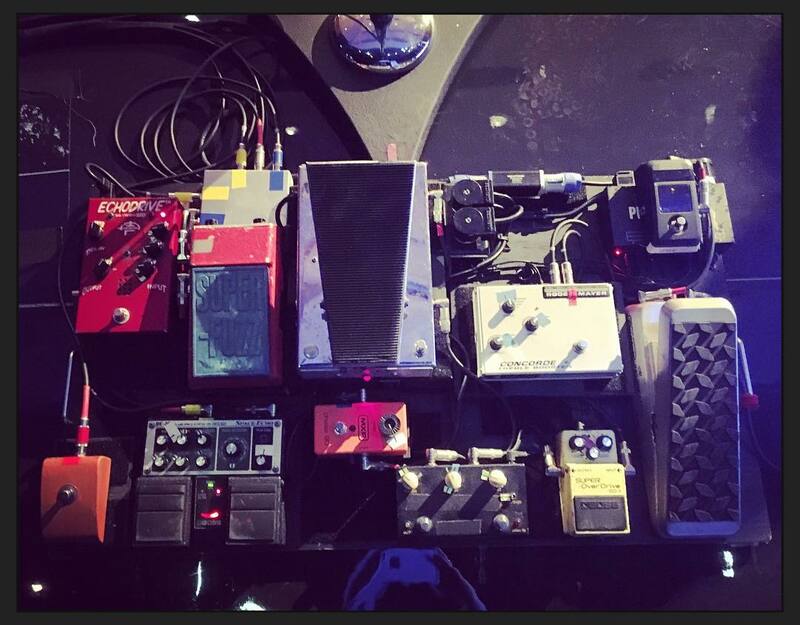 As shown in Way's pedals collection. 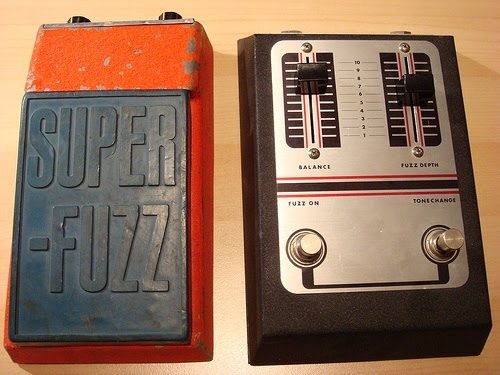 This article lists the Super-Fuzz among the gear Scott Holiday uses. "'The last two albums I was thinking more about playing the stuff live and this one, I didn't worry about it. If I wanted to put some keyboard in that would never get played live or something, I just did.' Mascis adds that the palette of guitar tones used on I Bet On Sky was quite a bit broader than in the band's early work. 'I used a '58 Tele a lot for leads and different things for rhythm like a Les Paul Junior - a bunch of guitars. Basically, P-90s for rhythm, and I used this Tonebender copy that Jim [Roth] from the band Built To Spill made. I used that on a lot of lead tracks usually combined with some other fuzz.' We mention that the woody, sweet fuzz tone on the new album's standout track Almost Fare was particularly chewy. Did that tone arrive courtesy of the Tonebender clone, too? 'Yeah, that's probably that one and maybe a [Univox] Super-Fuzz together. I was using the Tonebender on most tracks, then adding different fuzzes with it - sometimes three, usually just two.'" 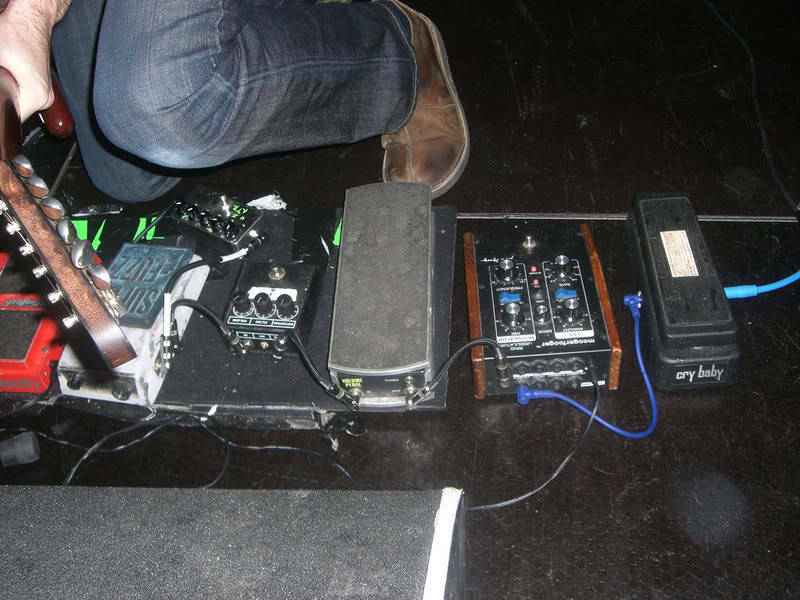 On his web site Bortnick details the collection of foot pedals that he uses for his guitar, such as the Electro-Harmonix Frequency Analyzer ring modulator, Univox Super Fuzz, Boss DD5 Digital Delay, DOD FX17 wah pedal, Boss Phase Shifter, Boss Blues Driver, and Ibanez AF9 Autofilter. "And in The Cramps I used a Univox Superfuzz – very classic and very great. I wouldn’t mind getting another one." It is beneath the headstock of his guitar. The red paint has been chipped off. An extremely worn Univox Super-Fuzz. All red is faded, but some sign of blue shows. I also use a Univox Super Fuzz pedal and a Maxon delay for slapback. When asked about what effects where used on Weakend Friends' album Common Blah: "Mostly went between my walrus audio harvester and an old univox super fuzz. Which are mostly what I use in general!" I had a red and blue (more like pinkish orange on mine) version that was given to me by a close friend and collaborator. She had it for years after finding it at a yard sale for 5 bucks. It didn't work right, but it was easy stuff to fix. I used it on some unfinished recordings and enjoyed it thoroughly at the time, however its not a versatile pedal and the octave is hard to dial in right. Without getting the octave up effect its really a mediocre fuzz/distortion sound in either EQ setting. I forgot to mention there's a fuzz knob, an output knob and a tone switch that goes from flat to scooped mids.Flat its very retro and 60s, scooped its like smashing pumpkins' Rocket. This guy got sold in MD last year to my boys at Atomic Music (check 'em out on the web). Maybe I'll build a clone one day if I miss it. I disagree with the statement it’s a two trick pony. SuperFuzz is multiple ponies. (I just need to add that I’m using the clone made by Analog Fox, but it’s the closest one (maybe together with Wattson), you can check Youtube side-by-side comparsions). Pots on the pedal do not provide a very wide range of sounds, but this fuzz is very sensitive on the dynamics of you playing, and especially on where do you play. Playing riff/melody lower on the neck - you get a thinner, very nasty and aggressive fuzz. Playing the same above 10-12th fret - tone gets rounder, upper octave and musical ring modulation begins to appear (but only when you play "dirty" intervals like min6 or b5). And you can get an entirely new palette by backing down volume on your guitar. It’s a pedal for patient experimentators and feinschmeckers, but you can definitely find a lot in it. do you have any idea how many vintage fuzzes I had at one point? I've owned at least one of everything but the unicorn of fuzzes, the sola tonebender mk1. For an octave fuzz the univox is very sensitive.... for a fuzz in genreal the sensitivity to playing dynamics is middling. Next to an original tonebender mk2 or mk3? Sorry. As far thick, high gain fuzz goes, those two circuits are the kings of touch sensitivity and volume clean up. And yeah, I know the ring mod trick, its like a faint version of the Octavia neck pickup sound.... but on an original it only comes off right when you have the internal trimmer dialed in just right for that guitar. The early silver oens with no trimmer are even more finicky. I think they address this in clones by ear testing each pedal and carefully mathcing transistors and the diodes used to create the octaving. But in vintage ones? Just trust me on this one. The superfuzz is an wesome pedal, don't get me wrong but in a dense band mix it has 2 basic sounds the audience will hear. Its nto worth the price of originals and for some reason the clones are pretty expensive... which is weird given that something as borring as a boss hyperfuzz is pretty much a superfuzz with some clever features added into the make up gain section. I'm not trying toa rgue with me, but I'm pretty old and I owned the pedal for like 10 to 15 years. Probably longer. I used it plenty. I knew all of tis secrets (had to fix it many times). When is at its a 2 trick pony I mean it broadly. You can fiddle with the pedal, your guitar controls and your playing a lot and tickle your fancy in a bedroom or the studio control room. In the end what cuts a mix is Pete or Billy (or Beasties on bass). I'm not telling you not to love your clone, just calling it as I see it. And if you really wan the upper octave good, roll your tone control on the guitar to 5 and then you can use anywhere above the 5th fret ;-) Then play the devil's interval to your heart's content. I also don't appreciate the implication that I have no patience. There's no need to insult me for my opinion. I'm just giving an honest review of a pedal I kept for a long, long time until the vintage resale value got so high I couldn't justify keeping it anymore for the 1 or 2 recordings per year. And reviewing the ORIGINAL unit that I had I'm really putting in light of the extreme cost of originals like mine. I don't know anything about the price performance ratio of clones. This is just one man's opinion but you're not talking me around it, not even by condescending me. great classic fuzz that can give mild octave fuzz sounds. Please note that im reviewing a pedal I built to the same spec as the original superfuzz...I really love this fuzz for the mild upper octave sounds the circuit can archive. I also like the more standred fuzz tones on offer here thanks to six 2n3904 npn silicon transistors.its a truly great fuzz that has much in common with the old shin ei fuzzes from the past, if you love fuzz this pedal is a absolute must!! I had the exact fuzz pictured and mine was anything but subtle when the internal trim pot was calibrated correctly to produce the octaving effect. The vintage ones produce a blitzkrieg of squealing octave.... in a good way. Kudos on your build, man! I know the prices of some of these pedals are really off the wall,especially when you think about whats actually inside them,but I know sometimes it just has to be done when the money's right and someones willing to pay money,although when I think about whats actually in some of these fuzzes and how cheaply some vintage fuzzes where made,(green russain big muffs for example,$400!! ),it really does makes you think,..yes thats right, I am looking for an fy2 as I only play and record with just a drummer (I knew it probably wouldnt cut through very well in a band context) and I really do like the sound of them.I do make my own pcbs though,so I think ill probably just end up making clone and see how i get on with that,but I think i would have to argree with you about the fy6 being better fuzz all round then the shin e fy2,the shin ei isnt ever going to be a always on kind of pedal is It,its an acquired taste kind of thing. Well the fy6 clone was made to the original schematic,although I did forget to mention that the one I made has a diode mod I can use to rain the thing back in a bit,("blitzkrieg is a great word for it":-). .so I used two germanium diodes for the two original didoes as found on the original pcb for a bit of mojo,plues two 1n914s pairs that I can swich in and out of the original fy6 circuit,..that basically clips some of the voltage and rains the fuzz and octave in a bit.i also set the trimmer pot for the octave to taste... its actually good little mod,I really like to use it on the the overdrive channal of a tube amp,with the gain on the amp set just when it starts to dirty up when you hit the strings,. . .thank you,ill have to see if I can post a vid here so you can have a listen to it,it would be cool to know what you think. Great vintage fuzz with the foot switch ya can't miss!